This article is about a variety of perilla. For a wider survey that covers deulkkae, see Perilla. For in-depth botany and biochemistry, see Perilla frutescens. For the city in Japan, see Shisō, Hyōgo. Shiso (/ˈʃiːsoʊ/, Japanese: 紫蘇 or シソ, Japanese pronunciation: [ɕiso̞]) is the more widely used name of the Asian culinary herb Perilla frutescens var. crispa, belonging to the mint family. In Vietnam, the plant is called tía tô(Vietnamese pronunciation: [tiɜ˧ˀ˦ to˧˧]). This herb was previously known as the "beefsteak plant", a mostly obsolete name. It is also sometimes referred to by its genus name "Perilla", which is ambiguous, as it is also inclusive of the so-called "wild sesame" variety, P. frutescens var. frutescens, which is devoid of the distinctive shiso fragrance. Shiso is a perennial plant that may be cultivated as an annual in temperate climates, and occurs in both red- (or purple-) leaved and green forms. There are also frilly, ruffled-leaved forms called chirimen-jiso and forms that are red only on top, called katamen-jiso. The Japanese name shiso (紫蘇?, シソ) and the Vietnamese tía tô are cognates, both a loan word from zǐsū(simplified Chinese: 紫苏; traditional Chinese: 紫蘇; pinyin: zǐsū; Wade–Giles: tsu-su), which means Perilla frustescens in Chinese. The first character 「紫(shi, murasaki)」 means "purple", and the second「蘇(so, yomigaeru)」 means "to be resurrected, revived, rehabilitated". Traditionally in Japan shiso denoted the purple-red form. In recent years green is considered typical, and red considered atypical. The plant occurs in red (purple-leaved) or green-leaved forms. It also has a less fashionable translated name "beefsteak plant", but starting around the 1980s, with the rise of popularity of Japanese cuisine, it has become increasingly more chic for the mass media to refer to it as shiso. Shiso is called soyeop(소엽) or chajogi(차조기) in Korean, and huíhuísū(回回苏) in Chinese. The purple-red type may be known as akajiso (赤ジソ/紅ジソ, "red shiso"). The quintessential use is for coloring the pickled plum, or umeboshi. The shiso leaf turns bright red when it reacts with the umezu, the vinegary brine that wells up from the plums after being pickled in their vats. The red pigment is identified as the Perilla anthocyanin, aka shisonin. The mature red leaves are not very amenable to use as a raw salad leaf. But germinated sprouts me-jiso (芽ジソ) have been used for years as garnish to accent a Japanese dish such as a plate of sashimi. Also used are the hanaho (花穂, flower cluster) or hojiso, which are sprigs or stalks studded with tiny-cupped flowers and forming seeds. The tiny pellets of buds and seed pods can be scraped off using the chopstick or fingers and mixed into the soy sauce dip to add the distinct spicy flavor. The sprouts and flowerheads of the green variety are also used the same way. Bunches of green shiso leaves packaged in styrofoam trays are now familiar sights on the supermarket shelves in Japan, as well as in Japanese food markets in the West. But production in earnest as leafy herb did not begin until the 1960s. One anecdote is that around 1961, a certain cooperative or guild of tsuma (ツマ, "garnish") commodities based in Shizuoka Prefecture picked large-sized green leaves of shiso and shipped them out to the Osaka market, and gained popularity, so that ōba (大葉, "big leaf") became the trade name for bunches of picked green leaves forever after. A dissenting account places its origin in the city of Toyohashi, Aichi, the foremost ōba-producer in the country, and claims Toyohashi's Greenhouse Horticultural Agricultural Cooperative (豊橋園芸農協) experimented with planting c. 1955, and around 1962 started merchandizing the leaf part as Ōba, and in 1963 organized "cooperative sorting and sales" of the crop (kyōsen kyōhan (共選・共販), analogous to cranberry cooperatives in the US). By c. 1970, they achieved year-round production. The scarlet-leaved form of shiso was introduced into the West around the 1850s, when the ornamental variety was usually referred to as P. nankinensis. This red-leafed border plant eventually earned the English-language name "beefsteak plant". This was the English equivalent name was in standard usage over a period, authoritative Kenkyūsha's New Japanese-English Dictionary. Due to that legacy, the old-fashioned name remains in circulation today. Other common names, "perilla mint", "Chinese basil", or "wild basil" are in use, as well. The alias "wild coleus" or "summer coleus" probably describe ornamental varieties. The red shiso or su tzu types are called purple mint or purple mint plant. It is also called rattlesnake weed in the Ozarks, because the sound the dried stalks make when disturbed along the footpath is reminiscent of the rattlesnake rattling sound. Suggested native origins are mountainous terrains of India and China, although some books say Southeast Asia. It spread throughout China some time in remote antiquity. One of the early mentions on record occurs in Renown Physician's Extra Records (Chinese: 名醫別錄; pinyin: Míng Yī Bié Lù), around 500 AD, where it is listed as su (蘇), and some of its uses are described. The perilla was introduced into Japan around the eighth to ninth centuries. The species was introduced into the Western horticulture as an ornamental, and in the United States became naturalized and established in a widespread area, and may be considered weedy or invasive. Though now lumped into a single species of polytypic character, the two cultigens continue to be regarded as two distinct commodities in the Asian countries where they are most exploited. While they are morphologically similar, the modern strains are readily distinguishable. Accordingly, the description is used separately or comparatively for the cultivars. Shiso grows to 40–100 centimetres (16–39 in) tall. Shiso has broad ovate leaves with pointy ends and serrated margins, arranged oppositely with long leafstalks. Shiso's distinctive flavor comes from its perillaldehyde component, which present only in low concentration in other perilla varieties. The red (purple) forms of the shiso (forma purpurea and crispa) come from its pigment, called "perilla anthocyanin " or shisonin. The color is present in both sides of the leaves, as well as the entire stalk, and flower buds (calyces). The red crinkly-leafed version (called chirimenjiso in Japan) was the form of shiso first examined by Western botany, and Thunberg named it P. crispa (the name meaning "wavy or curly"). That Latin name was later retained when the shiso was reclassed as a variety. Also, bicolored cultivars (var. Crispa forma discolor Makino; カタメンジソ (katamenjiso)) are red on the underside of the leaf (see pictured, top right). Green crinkly-leafed cultivars (called chirimenaojiso, forma viridi-crispa) are seen. Shiso produces harder, smaller seeds compared to other perilla varieties. Shiso seeds weigh about 1.5 g per 1000 seeds. Shiso contain only about 25.2-25.7% lipid, but still contains a comparable 60% ratio of ALA. The plant produces the natural product perilloxin, which is built around a 3-benzoxepin moiety. Perilloxin inhibits the enzyme cyclooxygenase with an IC50 of 23.2 μM. Non-steroidal anti-inflammatory drugs like aspirin and ibuprofen also work by inhibiting the cyclooxygenase enzyme family. A whole leaf of green shiso is often used as a receptacle to hold wasabi, or various tsuma (garnishes) and ken (daikon radishes, etc., sliced into fine threads). It seems to have superseded baran, the serrated green plastic film, named after the Aspidistra plant, that graced takeout sushi boxes in bygone days. Chopped leaves can be used to flavor any number of fillings or batter to be cooked, for use in warm dishes. A whole leaf battered only on the obverse side is made into tempura. Whole leaves are often combined with shrimp or other fried items. Red leaves are used for making pickled plum (umeboshi) as mentioned, but this is no longer a yearly chore undertaken by the average household. Red shiso is used to color shiba-zuke, a type of pickled eggplant (also cucumber, myoga, shiso seeds may be used), Kyoto specialty. The seed pods or berries of the shiso are also salted and preserved as a sort of spice. They can be combined with fine slivers of daikon, for instance, to make a simple salad. One source from the 1960s says that oil expressed from shiso seeds was once used for deep-frying purposes. The germinated sprouts (cotyledons) used as garnish are known as mejiso (芽ジソ). Another reference refers to the me-jiso as the moyashi (sprout) of the shiso. Any time it is mentioned that shiso "buds" are used, there is reason to suspect this is a mistranslation for "sprouts" since the word me (芽) can mean either. Though young buds or shoots are not usually used in restaurants, the me-jiso used could be microgreen size. People engaged in growing their own shiso in planters, will also refer to the plucked seedlings they have thinned as mejiso. The name yukari refers to dried and pulverized red-shiso flakes, and has passed into the common tongue as a generic term, even though Mishima Foods Co. insists it is the proprietary name for its products. The term yukari-no-iro has signified the color purple since the olden days, based on a poem in the Kokin Wakashū about a murasaki or gromwell blooming in Musashino (old name for Tokyo area). Moreover, the term Murasaki-no-yukari has long been used as an alias for Lady Murasaki's famous romance of the shining prince. Other than the yukari variety, there are many commercial brand furikake type sprinkle-seasoning products that contain shiso as well. They can be sprinkled on rice or mixed into musubi. They are often sprinkled on pasta. 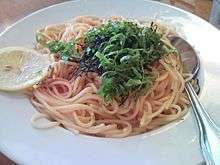 The shiso pasta can be made from fresh chopped leaves, sometimes combined with the crumbled roe of tarako, and the trick to success is not to cook the cod roe on the stove top, but to just to toss the hot pasta into it. Tía tô is a Vietnamese version of shiso, with slightly smaller leaves but much stronger aromatic flavor, native to Southeast Asia . Unlike the Perilla frutescens counterpart, the leaves on the Vietnamese perilla have green color on the top side and purplish red on the bottom side. In North and South Vietnam, the Vietnamese perilla are eaten raw or used in Vietnamese salads, soups, or stir fried dishes. The strong flavors are perfect for cooking seafoods such as shrimp and fish dishes. Aromatic leaves are also widely used in pickling. Plants can be grown in open field or container as a wonderful ornamental plant in the backyard. Bactericidal and preservative effects of the shiso, due to the presence of terpenes such as perilla alcohol, have been noted. The word ōba was originally a trade name and was not entered into the Shin Meikai kokugo jiten until its 5th edition (Kindaichi 1997), and is not found in 4th edition (1989). This dictionary is more progressive the Kojien cited previously, as Kindaichi's dictionary, from the 1st ed. (1972), and definitely in the 2nd ed. (1974) defined shiso as a plant with leaves of "purple(green) color". Raw data start from year 1960, but for the shiso, the production figure was either negligible (far less than 1000t) or unavailable until the year 1976, as shown. The 1970s was when refrigerated storage and refrigerated transport came online for shiso; but the same technology was bringing fresh produce and seafood to meal tables of ever-remoter parts away from farms or seaports. So foods like sashimi which was not daily fare for every Japanese was becoming exactly that, and the green shiso leaves, developed as a garnish for sashimi, quickly began to gain ground. The no. 1 producer of produce type shiso among the 47 todofuken in Japan is Aichi Prefecture, boasting 3,852 tons, representing 37.0% of national production (based on latest available FY2008 data). Another source uses greenhouse-grown production of 3,528 tons as the figure better representation actual ōba production, and according to this, the prefecture has a 56% share. The difference in percentage is an indicator that in Aichi, the leaves are 90% greenhouse produced, whereas nationwide, the ratio is just 60:40 in favor of indoors over open fields. As aforestated, Toyohashi, Aichi is the city which produces the most shiso vegetable in Japan. They are followed in ranking by Namegata, Ibaraki. There seems to be a growth spurt for shiso crops grown for industrial use. The data shows the following trend for crops targeted for oil and perfumery. ↑ Oxford English Dictionary, 2008, "shiso". WordReference. Retrieved April 1, 2012. , "shiso n. ... chiefly used as a herb in Japanese cookery"
1 2 query in the New York Times archives shows that "shiso" since 1981 had had 251 hits, and during 1990s - current, 243 , with 172 definitely in "+Japanese" context. Since 1981, perilla has 52 hits winnowed to only 12 in "+Japanese" context. Since 1981, occurrence of "beefsteak plant" scored 3 hits. ↑ Grbic, Nikolina; Pinker, Ina; Böhme, Michael (2016). "The Nutritional Treasure of Leafy Vegetables-Perilla frutescens" (PDF). Conference on International Research on Food Security, Natural Resource Management and Rural Development. Vienna, Austria. According to scientific nomenclature of Perilla two varieties are described: variety frutescens - mainly used in Korea as fresh vegetable or for making pickles, and variety crispa - a strongly branching crop mainly used in Japan and Vietnam, with smaller curly leaves rich in anthocyanins. ↑ Shinmura 1976, Kōjien 2nd ed. revised. (1st ed. 1955, the linguist who edited the dictionary died 1967). Definition of shiso translates to: "Annual of mint family. Native to China. Grows to 60cm. Stalk is rectangular, leaves are purple-red and fragrant.. (description of flower and fruit).. Leaves and fruit..used as an edible aromatic, and to color umeboshi. Occurs in green and chirimen (ruffle-leaved) forms." ↑ Evidence abounds in restaurant reviews and food sections. In the NY Times archives, Burros, Marian (October 21, 1983). "Restaurants". Retrieved March 29, 2012. , review of Gyosai restaurant, seems to be the earliest instance among hundreds of usage that have amassed over the years. ↑ Yu, Kosuna & Haga 1997, p.151, "Kondo (1931) and Kuroda and Wada (1935) isolated an anthocyanin pigment from purple Perilla leaves and gave it the name shisonin"
↑ 川上行蔵; 西村元三朗 (1990). 日本料理由来事典. 上. 朋舎出版. ISBN 978-4-8104-9116-6. ISBN 4-8104-9116-1. , quoted by "ことばの話1249「大葉と紫蘇」". 道浦俊彦の平成ことば事情(Toshihiko Michiura's Heisei kotoba jijo. 2003-06-26. Retrieved April 2012. Check date values in: |access-date= (help): "..一九六一（昭和三十六）年ごろ、静岡県の、あるツマ物生産組合が、青大葉ジソの葉を摘んでオオバの名で大阪の市場に出荷.."
↑ anonymous (March 1855), "List of Select and New Florists' Flowers" (google), The Floricultural cabinet, and florists' magazine, London: Simpkin,Marshall, & Co., 23: 62 "Perilla Nankinesnsis, a new and curious plant with crimsn leaves.."; An earlier issue (Vol. 21, Oct. 1853) , p.240, describe it being grown among the "New Annuals in the Horticultural Society's Garden"
↑ Tucker & DeBaggio 2009, p. 389, "name beefsteak plant.. from the bloody purple-red color.."
↑ Kenkyusha's (1954 edition) was verified. ↑ He, Kosuna & Haga 1997, p. 3, citing: Tanaka, K. (1993), "Effects of Periilla", My Health (8): 152–153 (in Japanese). ↑ Heibonsha 1964 Encycl. states egoma seeds are about 1.2 mm, slightly larger than shiso seeds. However, egoma seeds being grown currently can be much larger. ↑ Oikawa & Toyama 2008, p. 5, egoma, sometimes classed P.frutescens var. Japonica, exhibited sizes of 1.4 mm < sieve caliber <2.0 mm for black seeds and 1.6 mm < sieve caliber <2.0 mm for white seeds. ↑ Liu, J.-H.; Steigel, A.; Reininger, E.; Bauer, R. (2000). "Two new prenylated 3-benzoxepin derivatives as cyclooxygenase inhibitors from Perilla frutescens var. acuta". J. Nat. Prod. 63 (3): 403–405. doi:10.1021/np990362o. ↑ Fujita, Satoshi(藤田智) (2009). 体においしい野菜づくり (preview). PHP研究所. p. 78. ISBN 978-4-569-70610-8. ISBN 4-569-70610-X. , written by a horticulture professor at Keisen University and well-known gardening tipster on TV. quote:"発芽した双葉「芽ジソ(青ジソのアオメ、赤ジソのムラメ)」"
↑ Tsuji & Fisher 2007, p.164, commits this error, even though the book explains elsewhere, under the section dedicated to shiso that the "tiny sprouts (mejiso)" are used (p.89). ↑ Google search using keywords "芽ジソ"+"間引き" (Japanese for mejiso and thinning) turns up many examples, but mostly blogs, etc. ↑ "名前の由来 (origin to its name)". Mishima foods webpage. ↑ "Vietnamese Perilla (Tia To)". localharvest.org. Retrieved 8 November 2013. ↑ Aichi Prefecture (2011). "愛知の特産物（平成21年）". Retrieved April 2012. Check date values in: |access-date= (help), starred data is FY2008 data. ↑ This can be derived from MAFF-stat 2012a, with minimal data analysis. Aichi produces four times as much as the 2nd ranked Ibaraki Prefecture and Toyohashi grew 48% of it, so about double any other prefectural total. Larkcom, Joy (2007). Oriental Vegetables (preview). Frances Lincoln. pp. 112–. ISBN 978-0-7112-2612-8. ISBN 0-7112-2612-1. Ishikawa, Takayuki (石川貴之 ed.) (1997). 人気の日本料理―一流板前が手ほどきする (Chef's Best Choice Japanese Cuisine). Bessatsu Kateigaho mook (別冊家庭画報 ムック). Sekaibunkasha. ISBN 978-4-418-97143-5. ISBN 4-418-97143-2. Shinmura, Izuru (1976). 広辞苑(Kōjien). Iwanami. . Japanese dictionary. Heibonsha (1969) , "しそ", 世界百科事典(Sekai hyakka jiten), Heibonsha, 10, pp. 246–7 (world encyclopedia, in Japanese). The botany section by Yoshisuke, Satake (佐竹義輔); agricultural and nutrition by Nishi, Sadao (西貞夫); culinary section by Motoyama,Tekishū (本山荻舟). Okashin; Okazaki Shinkni Bank(岡崎信用金庫). "あいちの地場産業". Retrieved April 2012. Check date values in: |access-date= (help): right navbar "9 農業(野菜)"
MAFFstat (2012a). "地域特産野菜生産状況調査(regional specialty vegetables production status study". Retrieved April–2012. Check date values in: |access-date= (help). It gives to ink to H12 (FY2000), H14 (FY2002), H16 (FY2004), H18 (FY2006), H20 (FY2008) figures. They are not direct links to Excel sheets, but jump to TOC pages at e-stat.go.jp site. The latest available is TOC for The FY2008(年次) Regional Specialty Vegetable Production Status Study, published 11/26/2010. Under Category 3-1 Vegetables by crop and prefecture: acreage, harvest yield, etc. (野菜の品目別、都道府県別生産状況 作物面積収穫量等), find 10th crop shiso (しそ), and click Excel button to open p008-20-014.xls. Under Category 3-2, you can also retrieve Vegetable by crop and prefecture: major cutivars at major-producing municipalities (野菜の品目別、都道府県別生産状況 主要品種主要市町村 ). MAFFstat (2012b). "食料需給表 (food supply & demand tables)" (published 2011-6-20). Retrieved April 2, 2012. Check date values in: |publication-date= (help). Under Reports (View of Statisticl Tables) (報告書（統計表一覧）), click most recent year, e.g. FY2009 (平成21年度〔Excel：e-Stat〕) which is a TOC page not a direct Excel link.On this TOC(FY2009), under category: "Major Items By Crop Cumulative Tables" 主要項目の品目別累年表), locate heading 2-4-1, and next to "Vegetables Domestic Production Breakdown" (野菜の国内生産量の内訳) click adjacent Excel button for data (h001-21-071.xls). MAFFstat (2012c). "特産農作物の生産実績調査(specialty vegetables production realized study)". Retrieved April–2012. Check date values in: |access-date= (help). Links to H14 (FY2000) - H19 (FY2007) biannual figures, not direct link to Excel but jump to TOC pages at e-stat.go.jp site. The latest available is TOC for The FY2007(年次) Specialty Vegetable Production Realized Study, published 3/23/2010. Locate 1-1-10 is Shiso (しそ), where heading reads " Industrial crop sown acreage and production" (工芸作物の作付面積及び生産量, and click Excel button to open p003-19-010.xls. "Portals Site of Official Statistics of Japan". E-stat-go-jp. 2012. Retrieved April–2012. Check date values in: |access-date= (help). This site is nominally available in English, but the search engine is not very robust.